The verse is in reply to a question from what seems to be an anonymous group of people. These 'suttas' are not introduced by Ānanda saying 'evaṃ me sutaṃ', nor do they set the scene, so the context is obscure. However the earlier part of the sutta is questions about dependent arising and desire. All of the questions on this subject are answered, then the interrogators say they have one more question. Since the answer is phrased in terms of the question, it should become clear what the question was as we proceed. heke is an Eastern, or Māgadhan, form of eke 'some' (nominative plural). This form is not in PED. paneke had me foxed for a while until I saw the sandhi. It is pan' eke or pana eke. So note the predominance here of 'Eastern' forms which do not become standard Pāli, but fade out of use. These are not the kind of differences that would make Eastern and Western dialects mutually incomprehensible. Just minor differences like a Londoners dropping their h's (ironically pronounced haitch) or making the 'd' in London a glottal stop: Lon'on. From here working out the cases and conjugations is relatively straight forward. However this is verse and so the syntax is more difficult to work out. I like to look for words in the same case, as these words usually go together. So clearly heke and paṇḍitāse go together: 'some of the wise'. Putting it altogether took quite a lot of thought. In pada's a & b clearly heke paṇḍitāse vadanti is a unit 'some of the wise say'. If we ignore for the minute the indeclinables we find yakkhassa suddhiṃ aggaṃ. This could be 'the highest purity of the yakkha'. However we now bring in ettāvatta 'so far, to this extent', we find other possibilities. The sentence could be 'the highest purity of the yakkha is to this extent' (Norman adds ...[only] to this extent). The English is not very good, but the sense would seem to be that the highest purity of the yakkha only goes so far. So the question could be about the extent to which purification is possible, and the Buddha in his reply is saying "yes, some people think purity is limited", i.e. that no escape from saṃsāra is possible (this was the view of some Brahmins for instance). Another way to view the phrase is to see it as being about the extent of purification of the Buddha himself. Norman translates "...that the supreme purity of the yakkha is to this extent [only]..." (p.115) So if the yakkha is the Buddha then the question might not be abstract, but concrete. They might be asking about the Buddha's own state. However the following verse is very much phrased in abstract terms. Where to slot the idha 'here' is a minor problem, though as perplexing as all the rest. I put it where it seems to make most sense in English, but this is probably the foible of an amateur! the purity of the yakkha is highest to this extent [only]. Pada's c & d are hardly less puzzling. But if we work through it, order emerges. We have a pronoun in the nominative plural (eke) along with a verb in the 3rd person plural (vadanti) so this means 'some say'. The pronoun tesaṃ (plural dative or genitive) seems to fit: 'some of them'. Also in the nominative plural we have kusalā vadānā giving us 'some who call themselves experts say'. Now anupādisese looks like an accusative plural and samayaṃ looks like an accusative singular, though Norman says "there is no reason we should not take [anupādisese] with samayaṃ". I haven't mentioned these last two words before so let's do it now. Anupādisesa is a compound of a + upādi + sesa: and means not (a) having fuel (upādi) remaining (sesa). This references the fire metaphor and suggests someone who has not only extinguished the fires of greed, hatred and delusion, but who has no more fuel on which they might be reignited. Much was later made of this distinction by Theravāda exegetes, but I think it simply makes a distinction between a living Arahant (who still has the fuel of his senses, which could potentially fuel a fire) and the state of an Arahant after death when no more fire is possible. The -e ending is not explained by Norman or other authorities (so perhaps it was obvious to them, and not to me). Other translators seem in fact to take it as an accusative singular. Samayaṃ can mean 'time' or 'condition'; or sometimes 'congregation'. Now, the commentator in the Sutta-nipāta-aṭṭhakatha (aka Paramattha-jotikā II) glosses samayaṃ by ucchedaṃ - ie. reads it as a statement of nihilism. Not even the redoubtable Mr Norman can make sense of this! It more obviously suggests that the so-called experts say there is a 'time for' or 'condition of' anupādisese, i.e. of no-fuel-remaining, or complete liberation from greed, hatred, and delusion. The next verse is an elaboration of the Buddha's view in terms of understanding that experience is dependent on contact etc. It expands on the theme of anupādisese rather than introducing a whole new topic. The purity of the yakkha is the best to this extent [only]. It is the condition of no-fuel-remaining. By way of contrast here are some other translations. that the purity of the individual is best to this extent. I think this is with reference to forms that appears in Aśokan and later inscriptions. These showed dialectical variations like heke/eke. Norman tacitly acknowledges that yakkha refers to the Buddha (just as Nāga often does) in his note to verse 478 (p.260) and says he prefers to leave it untranslated, though without saying why (which is a rare omission for him). An interesting question is in what culture was a Yakkha (S. Yakṣa) seen as a high status being? Certainly not in Vedic culture, and not in later Buddhist culture. I note in passing that none of these discussions are in terms of ātman or brahman. I have been wondering lately whether there are any discussions in the Pāli which directly reflect these concerns. Norman reads upādi as 'grasping', but cf PED sv upādi "= upādāna, but in more concrete meaning of "stuff of life", substratum of being, khandha; only in combn. with ˚sesa (adj.) having some fuel of life (= khandhas or substratum) left, i. e. still dependent (on existence), not free, materially determined". By contrast CPD merely has: 'attachment'. Ireland's notes point out that "The term 'spirit' (yakkha) is equivalent here to 'being' or 'man." I don't think translating "the spirit" conveys this. (see also note8) Note also that Ireland follows the commentary in taking samayaṃ as 'nihilism'. Thanissaro also opts to translate yakkha as 'the spirit' (see comments in note 6 and 8 and in the text) and upādi as 'clinging'. Dhīvan's rendering of yakkha as 'individual' is interesting here - it universalises the statement without creating the kinds of problems introduced by terms such as 'spirit'. This is supported by PED sv yakkha (7): "Exceptionally the term 'yakkha' is used as a philosophical term denoting 'individual soul'... "ettāvatā yakkhassa suddhi (purification of the heart)". All from Chaṭṭha Saṅgāyana Tipitaka Version 4.0 (CST4). 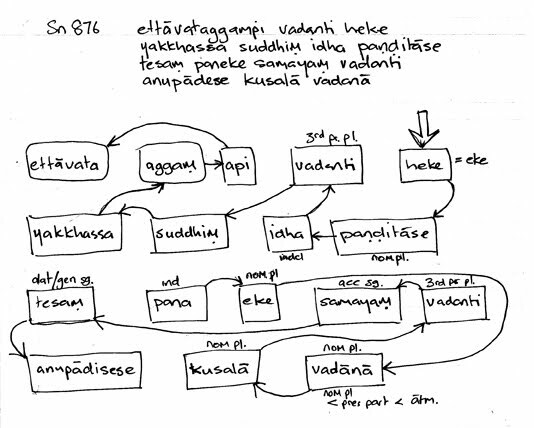 Kalahavādasuttaṃ. 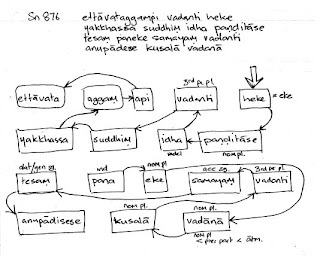 Sutta-nipāta (PTS Sn 876). Dhīvan. Kalahavivādasutta Discourse on Quarrels and Disputes (triṣṭubh). Unpublished translation. Ireland, John D. (trans) "Kalaha-vivada Sutta: Further Questions"(Snp 4.11). Access to Insight, June 14, 2010, http://www.accesstoinsight.org/tipitaka/kn/snp/snp.4.11.irel.html. Thanissaro. (trans) 'Kalaha-vivada Sutta: Quarrels & Disputes' (Snp 4.11). Access to Insight, June 8, 2010, http://www.accesstoinsight.org/tipitaka/kn/snp/snp.4.11.than.html.